In the short period of time the Haflinger Haus has been open, it has accomplished something that many restaurants only dream of. Finding a great chef, such as Chef Gerhard Schmid, who, by the way, is no stranger to culinary excellence. Chef Schmid has many accomplishments to his credit, ranging from past ownership of The Gateways Inn & Restaurant in Lenox, MA to teaching at the world-renowned Johnson & Whales College of Culinary Arts in Providence, Rhode Island for 11 years. The inside of the Haflinger Haus is warm and welcoming, with several dining areas available, ranging from small and private, to traditional and open. 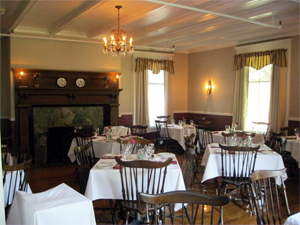 In addition, there is also a Tavern, offering bar and table seating, which is where we choose to be seated. The staff was very friendly and pleasant and seemed to truly enjoy working at the restaurant, which is always a nice added touch to the evening. Our server was Bill, who was also the bartender in the Tavern and as the night progressed and the restaurant became busier, our service remained great without a hitch. We placed our order, asking to have our entrees held until we were ready. We started off with two appetizers, the Crispy Shrimp and Stuffed Mushrooms. The Shrimp were large, nicely coated and cooked to a crisp, golden perfection and served with a bed of artichokes and capers, accompanied by toast points. The flavors of the shrimp as well as the artichokes and capers were outstanding. The Stuffed Mushrooms were also delicious, with a moist, not over cooked stuffing. The mushrooms were served with a side of blue cheese vinaigrette, all nicely plated on a bed of greens. The salads, which were included with both of our Entrees, were next. One served with Blue Cheese Vinaigrette and the other, with their House Vinaigrette. The greens were fresh with the Austrian potato salad, adding a nice touch to the salad. We enjoyed our cocktails and informed Bill that we were now ready for our Entrees. Cindy had the Baked Scrod, with an herbed stuffing, mashed potatoes and seasonal vegetables. The fish was fresh, moist and flaky, and cooked to perfection. The portion size was above average with a fabulous herbed stuffing. I opted for the Grilled NY Strip Steak, cooked medium with a herb hotel butter, seasonal vegetables and mashed potatoes. It arrived a perfect medium, my compliments to Chef Schmid and his staff. The vegetables and potatoes were also cooked and seasoned properly. To finish our Haflinger Haus dining experience, we each had a cup of decaf coffee and split a piece of Black Forest Cake. Talk about a rich, decedent dessert, this cake was all that and more. One of the unique and interesting observations we made, is the fact that they have a nice selection of American dishes, in addition to their marvelous selection of Austrian choices. On the American side, dishes like Shrimp and Garlic, Grilled NY Strip Steak, Pan Roasted Salmon Fillet and Baked Scrod. For the Austrian selections, Wiener Schnitzel, Haehnchen Jaeger Schnitzel, Ungarisches Gulasch with Nockerln, Käsespätzle, Sauerbraten mit Rotkraut und Knödel, Schweinshaxe mit Apfel Sauerkraut und Knödel, Schwenslenden Schnitten Champignon Sosse. Our next trip will definitely be for the Austrian or European fare. FYI, they also have six unique guest rooms at the Inn as well, for those wishing to stay in the area. Whether you live down the street from the Haflinger Haus or vacationing in the Southern Berkshires, a trip to the Haflinger Haus is a must! We’ll be back …and soon …hope to see you there!! !